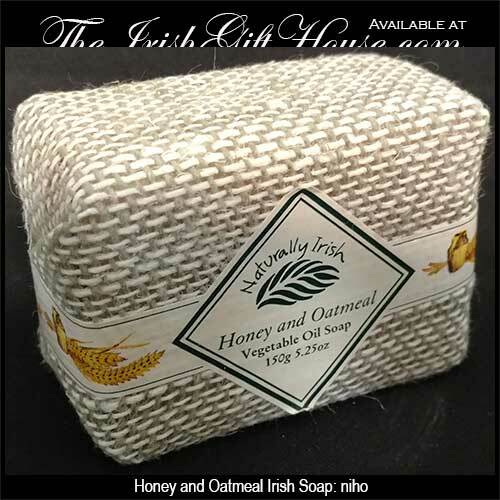 The honey and oatmeal soap is wrapped in pure Irish linen that may be used as an exfoliation cloth. An intriguing and wholesome soap mixture, honey & oatmeal invokes the goodness of the Irish countryside. The light natural vegetable oil in this Irish soap gently cleanse and protect the skin, while the aroma subtly relaxes the body and mind, releasing tension and renewing the spirit. Each bar of Irish soap weights 150grams (5.25 ounces) and is made in county Wicklow, Ireland by Naturally Irish.